I remember the film well from my movie reviewing days, but your piece makes me think the book would be well worth a look. I saw the film again a few months ago and liked it even more the second viewing. It's a bit ahead of its time, I think. Shariff and O'Toole are great in it. David, having finished the biography WILD BILL DONOVAN (the creator of OSS, forerunner of our CIA), as I mentioned in one of our conversations on military intelligence at Left Coast Crime, I have now gone on to start your e-book, BLACK TRAFFIC set in Cold War Berlin. 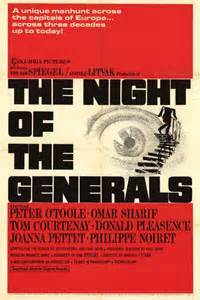 After your blog today, it looks like I'll have to go find NIGHT OF THE GENERALS next. I just finished reading Black Traffic on my Kindle. Great book! Saw Night of the Generals too long ago to properly remember it. Will have to watch it again. @Eve A couple or three years I saw a photo exhibit in the lobby of the NY Public Library, about artists' lives in Vichy France--writers, painters, dancers, intellectuals, etc. Some of them were pro-Fascist, some were Communists, some were anti-Semites, and so on: there wasn't any common political denominator, and so some were collaborators and some were active Resistance, but everybody made accommodations. Denial is simply a coping mechanism. @R.T. I'd be very interested to read the Donovan book. My own recommendation would be THE MAN WHO KEPT THE SECRETS, if you don't know it, about Richard Helms' tenure as DCI. I'd love to hear what you think of BLACK TRAFFIC---which reminds me I'd like to pick your brain sometime about your experience in RSVN, particularly in regard to the drug trade. @Dixon Flattery will get you anywhere with me. Thanks much. I owe at least one drink. I have seen Night of the Generals several times. I am pleased to admit that I am glad the murderer/psychopath General Wilhelm Tanz ultimately paid for murdering three hookers. Still, after the authorities produced Ex-Lance Corporal Hartmann and brought him to the reunion of the survivors of Tanz's old panzer division to confront Tanz, I am still surprised that Tanz was allowed to walk into an unoccupied room with a pistol an aide gave him to shoot himself. Why didn't the cops stop him if they really wanted to put him on trial?